John was born and raised in Detroit, Michigan. He went to Cooley High School, then graduated from Ferris State University. He then received his Master's degree at Wayne State University, majoring in Education. John was a teacher of Honors Chemistry at West Bloomfield High School. Summers were spent working at Charles Howell Scout Reservation and D - A Scout Ranch. After retiring, he filled his time traveling the U.S. and Canada by rail. He then traveled Michigan by car, visiting all of its towns and cities, traveling every mile of every interstate, state and county road in both peninsulas. In his travels he studied the many varieties of wild flowers and trees growing in the state. His major and overriding interest was the conservation of the environment. In lieu of flowers the family requests donations in his name to his favorite charity: The Nature Conservancy, 101 E. Cesar E. Chevaz Ave.Lansing, MI 48906, Att. 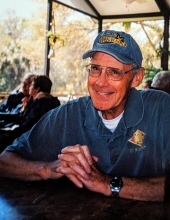 John Thomas Vian Tribute fund. To send flowers or a remembrance gift to the family of John Vian, please visit our Tribute Store. "Email Address" would like to share the life celebration of John Vian. Click on the "link" to go to share a favorite memory or leave a condolence message for the family.